No time for photos today because I had a medical appointment this morning and had to catch up with housework this afternoon. Yesterday though, after David and I took a trailer load of garden waste to the tip I decided to have a quiet afternoon and a play with the glass ball again. 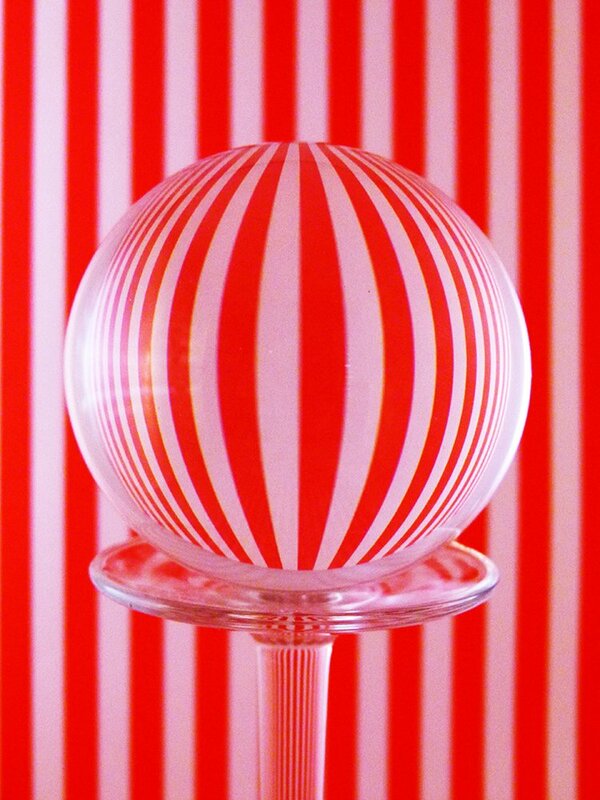 This shot is of the ball on an upturned wine glass against red and white coloured wrapping paper. I am quite pleased with the result. It looks quite nice on black. I think that photograph mounted, and framed would hang on any kitchen wall. Very well done. Glad you had "a play". Pretty professional head guiding you. What a striking image! Love it! Very creative. Definitely a fav! Love this!!! May have to steal this idea! Love, love, love it Babs. Another brilliant idea and a fav. This is so cool! Love it! Fav! This looks amazing. Have to try this ..
Beautiful composition, lines and colors. Crikey, not gonna miss that on a dark night. Very clever Babs. @peterday @julzmaioro @susie1205 @ethelperry @happysnaps @dide @fbailey @carole_sandford @mave @sdutoit @gilbertwood @tonygig @chimfa @hermann @louannwarren @jodies @leestevo @merrelyn @henrir @sarahlth @shesnapped @seattlite @pdulis @homeschoolmom @craftymeg @365projectcareylee @flowerfairyann @busylady @ingrid01 @suzanne234 @shepherdmanswife @yaorenliu @gardenfolk @cruiser @bintal @pyrrhula @radiogirl @skippysue @jgpittenger @kathiecb @bkbinthecity @golftragic Wow, thanks so much for the comments and favs for this shot and for putting it on the TP and the PP. Can't wait to see this on the TT soon. Wonderful idea, love how the stripes look in the ball, must give this a try! Very cool shot and I love the abstract look of it. most impressive and reminiscent of fairground scenes. This is awesome- mine never come out this good! Congratulations to you on the TT! Congratulations on TT. Well deserved. very creative Babs and congrats on your success here. Such a striking shot.. congrats on TT!